The Intelligence Corps along with the Royal Electrical and Mechanical Engineers, Army Medical Services, Adjutant General’s Corps and the Royal Logistics Corps form the British Army’s Combat Service Support forces. In 2012, the Combat Information Capability Directorate (CICD) brought together the Royal Signals and the Intelligence Corps in one central authority. 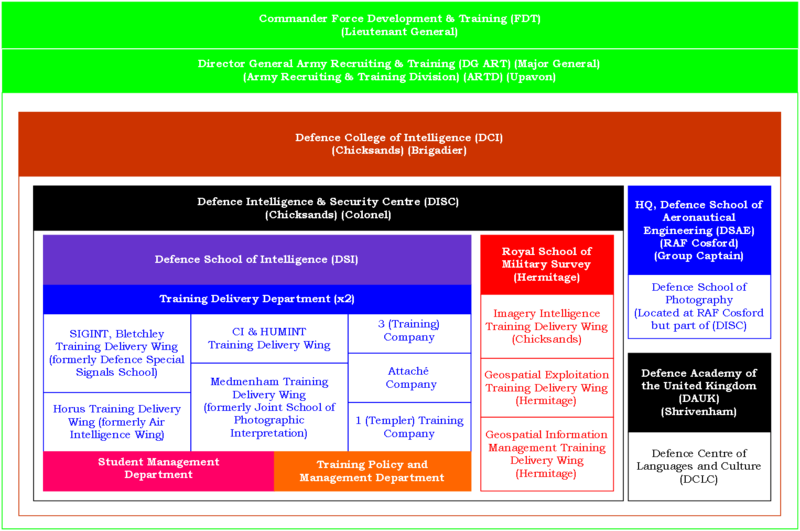 The Intelligence Corps’ Phase 2 specialist and Phase 3 career training is organised and delivered through a number of training providers (Figure 1). The Defence College of Intelligence is the main provider and forms part of the Army Recruiting and Training Division (ARTD), commanded by the Director General Army Recruiting and Training (DG ART), a Major General (OF-7), who in turn reports to the Commander Force Development and Training (FDT), a Lieutenant General (OF-8). Note: The Defence Intelligence & Security Centre (DISC) changed its name to the Joint Intelligence Training Group (JITG) on 01 January 2015. The role of the Intelligence Corps is to collect information from within and outside of the Battle Space and evaluate, analyse, integrate and interpret this information to provide intelligence for those in most need. The Intelligence Corps is co-located with the Joint Intelligence Training Group (JITG, formerly the Defence Intelligence and Security Centre (DISC) before 01 January 2015) at Chicksands in Bedfordshire. The structure of the Intelligence Corps is continually adapting to meet operational requirements, and currently comprises of a Military Intelligence Brigade which includes 3 regular and 2 reservist Multi Function Battalions. The Intelligence Corps also provides personnel to support a number of other units and establishments within Defence. Although one of the smallest Corps in the British Army much required of the Intelligence Corps who have a significant number of personnel preparing for, serving in or recently returned from operational deployment. The requirement for Operational Intelligence is a growth industry in which the Intelligence Corps are heavily involved. Under FR20 the Intelligence Corps Reserve are raising two new Reserve Battalions, 6 MI Battalion and 7 MI Battalion. Such is the demand for Operational Intelligence support that the Intelligence Corps are looking to recruit over 1000 personnel over the next 4 years. The Corps requires high quality Officers and Soldiers to man these new Reserve Units as well as continuing to recruit into the Regular Forces. The Intelligence Corps offers the same financial incentives as the rest of the Army: In order to retain ex-regulars’ valuable expertise within the Army a commitment bonus of up to £10,000 is being officered for ex-regular junior officers (captain and below) and ex-regular other ranks who join the Army Reserve. Direct entrants (new recruits) will be paid £300 upon enlistment, £1,000 for completing Phase 1 training, and a further £1,000 for completing Phase 2 training. The Defence College of Intelligence (DCI) is located at Chicksands in Bedfordshire and is commanded by a Brigadier (OF-6). The site was closed as an RAF station in 1997 and handed over to the Intelligence Corps allowing the Corps Headquarters and training delivery to re-locate from Templer Barracks in Ashford, Kent. DCI is the location of the Joint Intelligence Training Group, the Headquarters of the British Army’s Intelligence Corps, several smaller operationally orientated units and Reserve Forces. The Joint Intelligence Training Group (JITG), Chicksands, and incorporates the Defence School of Intelligence delivering intelligence training for all three services. The Defence Centre for Languages and Culture, Chicksands satellite site. The Defence School of Photography, Cosford, delivering specialist photographic training. The Royal School of Military Survey, Hermitage and Chicksands, delivering map training. For a detailed insight into the working of intelligence across the various Ministry of Defence organisations see Section 10.0 (Further Reading). Commandant JITG is dual-hatted as Director of the Intelligence Corps. The Commandant, a Brigadier (OF-6), is responsible for delivering inteligence training to tri-Service personnel and Civil Servants through the Defence Schools of Intelligence (Chicksands) and Photography (Cosford) as well as the Royal School of Military Survey (Hermitage). As Director of the Intelligence Corps, is responsible to the Chief of the General Staff for setting and monitoring the standards of the Corps as well as the provision of intelligence and security advice to the General Staff. The primary role of Chicksands is training and as such, it draws students and staff from the Royal Navy, Army, Royal Air Force and Civil Service together with a small number of foreign exchange personnel. 7010 (VR) Photographic Interpretation Squadron RAF, based RAF Wyton, trains imagery analysts to support RAF intelligence units in the UK and on operations overseas. HMS Ferret: is a training unit of the Royal Naval Reserve which delivers intelligence-related operational capability. Training: in the training sphere JITG delivers training for Phase 2 and Phase 3 to both military and civilian students in the Security, Language, Intelligence and Photographic specialisations. Language and Photography training take place at Beaconsfield and RAF Cosford respectively. Support: JTIG provides a full range of support functions to all Units and Lodger Units including Directorate of the Intelligence Corps, 15 Psychological Operations Group and the Army Information Security Unit. The provision of advice on the formulation of concepts, policy and doctrine across the spectrum of Intelligence and Security. In terms of delivery of operational capability across Defence JITG provides an effective capability to PJHQ-commanded operations, including, for example Op TELIC in Iraq. JITG also provides advice to the front line commands on operational capabilities. In addition, JITG capability contributes to the UK’s Defence Diplomacy Programme through the deployment of Training Teams. The Joint Services Intelligence Organisation (JSIO): Resistance to Interrogation (R2I) training, now known as ‘Conduct after Capture’ (CAC) was conducted at JSIO in order to give those military forces who are designated ‘prone to capture’, an indication of the stresses and pressures that they may face if they are captured by an enemy. During the reorganisation CAC training became the responsibility of the RAFs Air Command. Tactical Intelligence Branch: preparation of Battalion and Brigade Intelligence Cell staff prior to deployment. This team training involves an intense package delivered to a diverse rank range from the Private soldier to Junior Officer. Army Combat Intelligence Branch: instructs intelligence at the Unit and Formation level. Air Intelligence Branch: delivers Joint Air Intelligence Courses with RAF and RN officers in attendance. DISS delivered Phase 2 training to soldiers through 1 (Templer) Training Company and Phase 2 training to officers via the Junior Officers Course. Training for officers focused on imagery analysis with general intelligence being taught at Ashford on a 3-week course at DISS, the renamed SSI (School of Service Intelligence). The first professional Air Intelligence course (RAF Intelligence Course, RAFIC) was run in the Air Intelligence Wing of DISS in 2000, following the school’s move to Chicksand. After the first two courses, the Royal Navy was invited to send officers to attend and the course was renamed the Joint Air Intelligence Course (JAIC), a 5-month course. In 2005, DISS became part of the Defence College of Intelligence and the Air Intelligence Wing was renamed Horus Training Delivery Wing. Following a re-organisation in 2007, the structure was changed again and the Defence School of Intelligence (DSI) was set up with Air Intelligence Wing as a sub-organisation as the Phase 2 training unit (professional specialist training) for all RAF Intelligence Analyst Airmen, RAF Intelligence Officers, plus as a Phase 3 training unit (Continuation Specialist Training) for RAF Intelligence Analyst NCOs and Royal Navy and British Army Officers employed in air intelligence duties. Defence Special Signals School (DSSS): provided technical training to ensure that specialist linguists and non-voice tradesmen, across the three services, were fully prepared for their operational roles within their future field units. Joint School of Photographic Interpretation (JSPI): provided training for imagery analysts and RAF Trade Group (TG) 14 airmen. During 2004 the Royal Artillery Gunner graduates from the United Kingdom Imagery Analyst Course (UKIAC) were taught as part of the emergent WATCHKEEPER training programme. SIGINT, Bletchley Training Delivery Wing: formerly the Defence Special Signals School (DSSS); delivers signals intelligence (SIGINT) training. Also known as the Signals Intelligence Wing, is commanded by a Major (OF-3) and and is where Royal Signals Electronic Warfare Systems Operators conduct elements of their training. Horus Training Delivery Wing: formerly the Air Intelligence Wing. This wing delivers the Joint Air Intelligence Course (JAIC) to officers and the Operational Air Intelligence Course (OpAIC) to airmen. CI & HUMINT Training Delivery Wing: delivers counter intelligence (CI) and human intelligence (HUMINT) training. HUMINT training is delivered through a modular course which allows students to train to a basic level of operational competence and, on return from deployment on HUMINT duties, continue training to further advance their skills. Medmenham Training Delivery Wing: formerly the Joint School of Photographic Interpretation. 1 (Templer) Training Company: no details. 3 (Training) Company: no details. The Royal School of Military Survey (RSMS) is a joint services survey training facility associated with the Corps of Royal Engineers (RE) but operates under the command of JITG, and is located in Hermitage, Berkshire. RSMS consists of three training wings: Geospatial Information Management and Geospatial Exploitation, based at Hermitage, and Imagery Intelligence, based at Chicksands in Bedfordshire. To exploit the growing synergies between Geospatial Intelligence (GEOINT) and Imagery Intelligence (IMINT) all geospatial and imagery analysis training and education is now the responsibility of RSMS. Geospatial Exploitation (GE) Wing: soldiers are taught the how to collect geospatial data using the latest digital capture methods including handheld Personal Digital Assistant (PDA), Imagery Exploitation and 3D feature extraction, in-depth analytical techniques using powerful GIS software, 3D Visualisation, and terrain analysis. Together, these subjects are key elements in increasing the knowledge and understanding of military Commanders during their planning process. Geospatial Information Management (GIM) Wing: is responsible for the provision of the fundamental principles of map science and cartography, key elements in ensuring the quality of products is of the highest standard. Information management in the modern day is fast becoming a growth area. Of course, the work of ME (Geo) soldiers is highly regarded and to ensure that the ‘customer’ has the most up-to-date information, efficient and timely dissemination is vital. Imagery Intelligence (IMINT) Wing: is responsible for the training of UK Armed Forces in the principles and practices of imagery analysis and full motion video interpretation up to a training performance standard. The operational workplace then takes the raw recruit up to the operational performance standard through on the job training. RSMS provides all of the training to Royal Engineers geographic officers and soldiers, as well as navigation courses to the rest of the Defence community. Courses taught at RSMS range in duration from three days to 14 months. Geospatial education and training for Royal Engineer (RE) Geographic Officers, Defence personnel, and international students is provided through the MSc in Defence Geographic Information awarded by Cranfield University since 1993. From August 2009, this course has been developed into an MSc in Geospatial Intelligence to provide opportunities for Defence personnel to achieve an MSc through a variety of delivery modes including full time at Hermitage, part time, and distance learning. The change was in keeping with the evolution of defence survey and was very little more than a name change. The premier course offered by RSMS is the 14 month resident Army Survey Course (ASC). The ASC is designed to be a demanding programme focusing on the various fields pertaining to geospatial information and its application within the defence community. Successful completion of the ASC results in the conferment of an MSc in Geospatial Intelligence from Cranfield University. In this relationship RSMS is responsible for course content, while Cranfield University is involved with oversight and program accreditation. Cranfield University and RSMS faculty meet regularly to ensure that each student is attaining the high standards required for graduation. Fully successful students graduate from Cranfield University, Cranfield Defence and Security (CDS) during the July following the course (Cranfield University, 2014). Previously students graduated from the Defence College of Management and Technology, based at Shrivenham, Oxfordshire. Trade training for RE Geographic Technicians is recognised through a Foundation Degree in Applied Computing (Defence Geographic Information) accredited by Sheffield Hallam University (SHU). A recent development has been the addition of a Bachelor’s Degree in partnership with SHU to provide RE Geographic Technicians with the opportunity to further develop their technical and academic competencies. In addition to the accredited courses, RSMS also delivers a range of specialist courses to Defence personnel, including Imagery Analysis, Full Motion Video Interpretation, GPS, Map Reading, Land Navigation, Geographic Information Systems and Terrain Analysis. The school is based at Denison Barracks in Hermitage, Royal County of Berkshire. The Defence Centre for Languages and Culture (DCLC) sits within the College of Management and Technology, which is part of the Defence Academy of the United Kingdom (DAUK) located in Shrivenham, near Swindon. The DCLC was formerly the Defence School of Languages (DSL) located at Beaconsfield Station but closed on 09 September 2013 (GetBucks, 2013) as part of the Ministry of Defence’s (MoD) rationalisation programme. Foreign Language Wing (FLW): provides contingency language training and training in Arabic, French, Russian and Spanish. English Language Wing (ELW): ELW delivers English language and cultural training to international military and attached personnel on behalf of the MoD in order to enhance operational capability, support the UK’s International Defence Engagement Strategy and wider Defence Diplomacy. A Training Support Cell (TSC). Additional languages are trained on a bespoke basis, co-ordinated and assured through the TSC. A number of language training courses, including phase 2 training, are delivered at DAUKs Chicksands site. The Defence School of Photography (DSOP) is a part of JITG but is located at the Defence School of Aeronautical Engineering (DSAE) at RAF Cosford. DSOP is responsible for Phase 2 and 3 photographic training for all 3 Services. DSOP is dedicated to Defence photographic training and the vast majority of the DSOP’s learning population is operationally focused. However, for most of DSOP’s trainees, photography is not their primary duty in the Services; rather, to fulfil their assigned role they are required to attend DSOP on short, pre-employment training courses to meet Defence requirements. Those students who undertake the long (28-week) career course also gain an Advanced Apprenticeship in Photo Imaging. The data has been rounded to the nearest 5, and ~ indicates zero or rounded down to zero. Human Intelligence (HUMINT): People are the Army’s most valuable assets. This includes Army personnel, prisoners of war and civilians. Soldiers are an obvious asset – the Army could not operate without the skilled, talented and dedicated people that make up its personnel. However civilians and prisoners of war are also assets as they form an invaluable source of intelligence. HUMINT specialists work in a systematic and controlled way to assimilate crucial pieces of intelligence from people such as refugees, prisoners of war, or the local people who live in the area where the Army is operating. HUMINT operators provide commanders with timely, accurate and often unique intelligence on an enemy’s intentions, capabilities and way of working. Signal Intelligence (SIGINT): SIGINT specialists glean information from enemy transmissions and use leading-edge technology to intercept anything from faxes, to emails and satellite communications. The very nature of the technology used means that these communications can be intercepted a long distance from the battlefield itself. SIGINT operators need to identify key elements of intelligence from within the vast array of transmissions that take place every day; identifying the important from among the worthless. Once identified, intelligence from SIGINT sources is carefully analysed and quickly processed into a report and communicated to the operational commanders. SIGINT operators are often linguists, working in real time to decode cryptic messages passed in a foreign language. Electronic Warfare (EW): EW specialists employ similar skills and technology to those in used in SIGINT. The main difference is that EW tends to work at a tactical level, close to where the fighting is, intercepting battlefield transmissions. To work effectively in this field, soldiering skills are of critical importance. To keep pace with the battle, EW operators need to move frequently and safely within a potentially hostile environment. EW specialists usually work on several levels simultaneously, in real time. They piece together enemy communications to identify key facts, such as the location of the enemy’s headquarters, and the location or movements of artillery units and tanks for example. Language skills can be vital in this role, as transmissions need to be interpreted and analysed quickly in order to be of use to operational commanders. At the same time as doing this, the EW operator may also jam transmissions to prevent the enemy from successfully using their own communications. Imagery Intelligence (IMINT): IMINT specialists interpret images taken from a variety of sources including satellites and reconnaissance aircraft. The information they ascertain can be vital and may include intelligence central to a battle, such as the exact location of the enemy and what they intend to do. Developments in technology mean that Imagery Analysts (IAs) need to remain on top of their game despite constantly evolving new platforms and sensors. An IA is trained to operate in support of commanders engaged in both conventional and non-conventional warfare. At times the IA will be required to provide direct support at Battlegroup (BG) level to front line Company groups. IAs may also be required to provide analysis and assessment of strategic level importance. Airborne Imagery Analysts (AIAs) are trained in flight crew drills in order to operate imagery analysis systems fitted within fixed wing aircraft. Modern imagery sources mean that Imagery Intelligence can be collected, collated, analysed and disseminated in just hours – minutes if the commander needs it immediately. Operational Intelligence (OPINT): OPINT is one of the mainstream roles and includes Close Support (CS) at the operational and tactical levels. CS OPINT Sections provide direct support to Brigade HQs and smaller teams operate at BG and Company (Coy) level providing direction to aerial or ground based collection assets. The received data is then analysed to provide Intelligence updates and assessments to ground commanders. GS OPINT Sections operate at the operational and strategic levels providing direct support to Brigade HQs and Operational Intelligence Support Groups. GS OPINT personnel are responsible for producing and delivering thematic papers and reports based on detailed analysis and assessment. Employment within an OPINT role can be extremely challenging and equally rewarding. Available assignments include direct Intelligence support to 16 Air Assault Brigade, 3 Commando Brigade and other specialist units and organisations. Opportunities are available for INT CORPS Operators to volunteer for P Coy, Commando course, and UKSF Selection. Languages: The opportunity exists for Intelligence Corps personnel to be trained in the use of a number of different languages. The courses which are available are mainly focused on the Middle Eastern and Central Asian languages including Dari and Pashtu, but many others are available. On completion of the 24 month language course the individual is then provided the opportunity to use their language in support of operational requirements. Provided by the Defence Operational Languages Award Scheme (DOLAS), initial qualification awards include a single lump payment of up to £11,700, and a daily rate payment of up to £70.20. Counter Intelligence (CI) and Security (Sy): CI and Sy is an extremely important mainstream role which provides the opportunity for the Operator to become involved in a multitude of different duties. CI and Sy duties include research and analysis into enhancing Force Protection and Security Measures where Operators are responsible for the production and dissemination of Threat Assessments and Security Reports. Covert Passive Surveillance (CPS): CPS duties are very complex, dynamic, and fluid. CPS Operators are highly skilled in both foot and mobile navigation, use of covert communication and imagery collection systems, advanced driving techniques and counter surveillance drills. Often required to work alongside specialist organisations the CPS role is at times extremely high tempo, and at times slow paced, methodical and deliberate. Debriefing/Interrogation: Intelligence Corps personnel are trained in Debriefing and Interrogation (D&I) techniques when required to fill specific assignments. Employed in both operational and non-operational roles the D&I Teams are responsible for extracting vital information from high value personnel. Cyber Threat Analysis: Military Intelligence Analysts may be required to counter the cyber threat to the Army and the wider military environment. This may be by identifying the source of potential and actual threats as part of a counter-intelligence team; by developing measures to mitigate the threat whether by technical means or revised operating procedures, or by ensuring that the security measures taken by the military to protect their Communications Infrastructure Systems (CIS) remain robust and fit for purpose. Materiel and Personnel Exploitation (MPE): forms an increasingly important tool in the armoury of the military as it works to defeat terrorism and threats to the Rule of Law. A Military Intelligence Operator could find themselves directly involved as an MPE expert, providing advice and assessment to senior commanders which will both help defeat the enemy and reduce friendly force casualty numbers. An Operator Military Intelligence (Linguist) (OPMI(L)). The OPMI course lasts 27-weeks and as well as giving an introduction to the multi-specialist nature of Intelligence Corps work, this stage of training provides a firm grounding in many of the skills needed for a career in the corps. In addition to information gathering and interpreting techniques, training includes how to present and share data. The first stage of trade training takes place at Templer Training Development Company and covers all aspects of the OPMI trade including clerical training, OPINT, CI and driver training. An introduction to Signals Intelligence, Imagery Intelligence and Human Intelligence is also included. There is a 1-week break for adventurous training and, although activities vary, includes rock climbing, hiking, white water rafting and orienteering. Trade training culminates in a 4-week military leadership and management training course at the end of which soldiers will be promoted to Lance Corporal, and a passing-out parade in front of invited family and friends. OPMI(L) will complete a 78-week language course during which they will be promoted to Lance Corporal and also qualify for specialist pay. After successfully passing the 44-week Commissioning Course at the Royal Military Academy Sandhurst (RMAS) direct entry officers will attend a 2-week introductory briefing course at JITG. Officers will then complete a 6-12 month tour with the Infantry or Royal Armoured Corps to consolidate their skills, after which they will attend the 17-week Intelligence Corps Junior Officers’ Course. As a newly qualified Intelligence officer, officers may then serve in the Field Army as a Section Commander on operations. In the British Army, there are many excellent career and personal development opportunities. The training that an individual completes will depend on which area of specialisation they choose. A number of these courses also attract civilian qualifications and all of the training delivered by the Intelligence Corps provides soldiers with skills that are highly sought after by civilian employers including risk analysis, languages, IT, security and management. In 2012, it was estimated that the cost per soldier recruit for Phase 2 training for the Intelligence Corps was £5,460 to £5,570 (HC, 2012). Davies, P. (2013) Comment: The Preventable Decline of British Defence Intelligence. Available from World Wide Web: http://www.politics.co.uk/comment-analysis/2012/12/06/comment-the-preventable-decline-of-british-defence-intellige. [Accessed: 24 March, 2014]. Ministry of Defence (2014) Defence Intelligence: Roles. Available from World Wide Web: https://www.gov.uk/defence-intelligence-services. [Accessed: 22 March, 2014]. Cranfield University (2014) Cranfield Defence and Security. Available from World Wide Web: http://www.cranfield.ac.uk/about/people-and-resources/schools-and-departments/cranfield-defence-and-security/. [Accessed: 20 March ,2014]. DAUK (Defence Academy of the United Kingdom) (2014) English Language Wing Course Prospectus 2014. Available from World Wide Web: http://www.da.mod.uk/colleges/cmt/defence-centre-for-languages-and-culture. [Accessed: 22 March, 2014]. GetBucks (2013) Bucks Farewell to Defence School of Languages. Available from World Wide Web: http://www.getbucks.co.uk/news/local-news/bucks-farewell-defence-school-languages-6058876. [Accessed: 22 March, 2014].